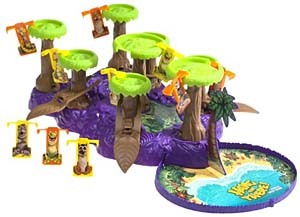 Attempting to hook their herd of T-shaped animals from treetop to treetop, players control the up-and-down timing of a pair of palms on individual sides of the jungle. When it comes to nerve-wracking, steady-handed jungle hilarity, so far so good with Hang In There. Attempting to hook their herd of T-shaped animals from treetop to treetop, players control the up-and-down timing of a pair of palms on individual sides of the jungle. But it's the battery-powered quartet of rotating (sometimes clockwise, sometimes counterclockwise) trees that makes for frustrating, frolicsome, fauna fun. Time things well and your beast hooks onto the next tree; time things poorly and your opponent sends you backwards by hooking you onto one of his. The jungle drum music is effectively distracting; miss a connection and the fallen animal must begin again. The all-plastic game construction requires some assembly, but adults will find game play as addictive as kids will. It is a giddy blend of strategy, hand-eye coordination, and lucky timing.